Woah. Last night I went along to the Bear's Den christmas show at St John on Bethnal Green, a night raising money for Support Act. The organisation's usual way of fundraising is essentially asking for a tiny donation of £1 from people who are on the guest list for various shows, and they distribute the funds between Refugee Action and Road To Freedom. There's more info about the organisation on their site here. 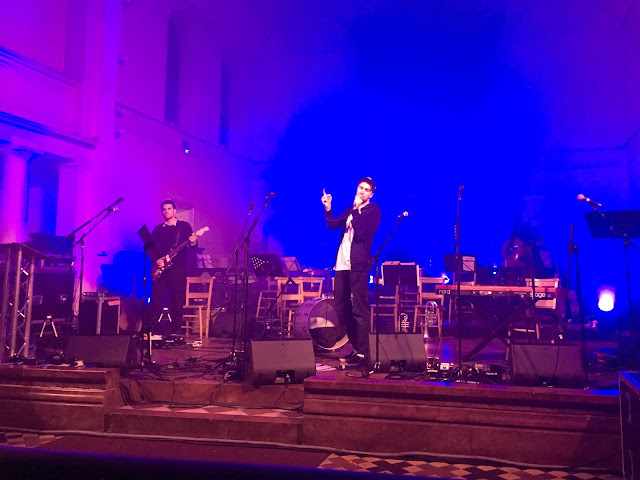 Charity gigs are always incredibly heartwarming, knowing that you're part of a group of people coming together to do something good, and church gigs are usually pretty special, so combine all that with a brilliant bunch of musicians and last night was quite the evening! The night was split into two halves, with a bunch of special guests performing a couple of tracks each, first up Justin Young and Freddie Cowan of The Vaccines, whose second track was a cover of The Ramones' Baby I Love You, with Tom Hobden accompanying them on violin. A blurry Freddie and Justin of The Vaccines kicking off the evening! Next up was Seramic, one of my favourite new artists - it's Marcus Foster's new project and its energetic, lively and a lot of fun. I was pretty intrigued by how they'd perform in the stripped back setting, but performing as a duo they opened with People Say, from the incredible Found EP, and it was one of the highlights of the evening for me! Next up and playing their stunning track Elijah to open their part of the show, was Matthew & The Atlas. I've seen them once before playing just before Bear's Den in a church for Bushstock, great to keep the church theme going! Matt's voice is such a beautiful thing to behold - check out this Mahogany Session of the same track. Big up to them for playing a cover of Have Yourself a Merry Little Christmas too! While we were waiting in the queue (to get to the front pew, of course) I spotted Lucy Rose as she arrived, and was fairly excited to note that she was with Jack Steadman (lead singer of Bombay Bicycle Club). He joined Lucy for her set, where they played her track Shiver and a cover of In The Bleak Midwinter which I recorded and you can listen to below... didn't realise how much I'd missed hearing Jack's voice! Next up, an artist I have heard about a lot, but have never taken a proper listen to.. Benjamin Francis Leftwich, who I think is actually playing a London residency at Omeara starting in March, info here! I'll definitely be taking a listen to some more of his music as his performance was pretty impressive. After a little interval, a chance to buy a ton of mince pies and mulled wine (yuck) and stretch the legs, we were quietened down so that Bear's Den could take to the stage. Having a sort of programme/order of service for the night meant that I knew what tracks coming, but it was still such a joy for them to begin with one of their biggest, Agape (particularly as when I caught them in the church at Bushstock, I had to leave to catch the train as they started playing it!) They followed it with Dew on The Vine and Elysium, before playing their new track Berlin (which they premiered online a few days ago) live for the first time. Check that out below.... really beautiful stuff! They followed it with Gabriel, Napoleon and Isaac, for which Tom Hobden snuck out and joined them on violin. They were then joined by the Alda Orchestra for the rest of the set including another of their own tracks and a Matthew & The Atlas track, and a bunch of the other musicians joined them on stage for a couple of Christmas covers and a stunning Leonard Cohen tribute. It all got pretty emotional towards the end of the evening as Kev and Davie thanked everybody who had helped put the show together, including Communion, their crew, the other bands, the church, so many brilliant people pulling together to create a fantastic night of entertainment for an incredible cause, and after their final track the band left the stage to roaring applause and a standing ovation. Waiting around after it was lovely to chat to some of the artists and tell them just how beautiful it all was, and to congratulate Kev and Davie on putting on such a brilliant show. Definitely won't be forgetting last night in a hurry! Now to get ready for my penultimate gig of the year, another Tigmus show of course... think this is gig number 77 this year!